"This is a great dish that's very easy to make with just a few ingredients. Great with rolls of any type. 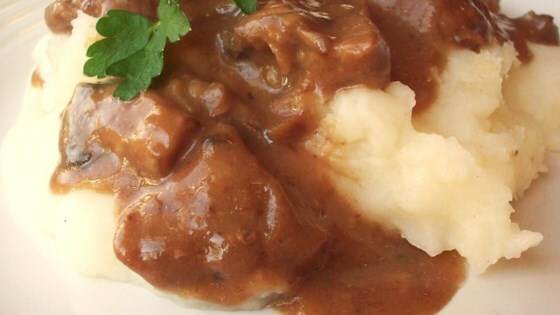 I got this recipe from my mom years ago and it is a family favorite." In a 13x9 inch casserole dish, combine the mushroom and beef onion soups, canned mushrooms and water. Mix thoroughly and add beef tips. Turn to coat well. Bake in a preheated oven for 1 hour. While beef tips are baking, bring a large pot of lightly salted water to a boil. Add pasta and cook for 8 to 10 minutes or until al dente; drain. Serve beef tips and sauce over noodles. See how to make a simple, beefy noodle dish.